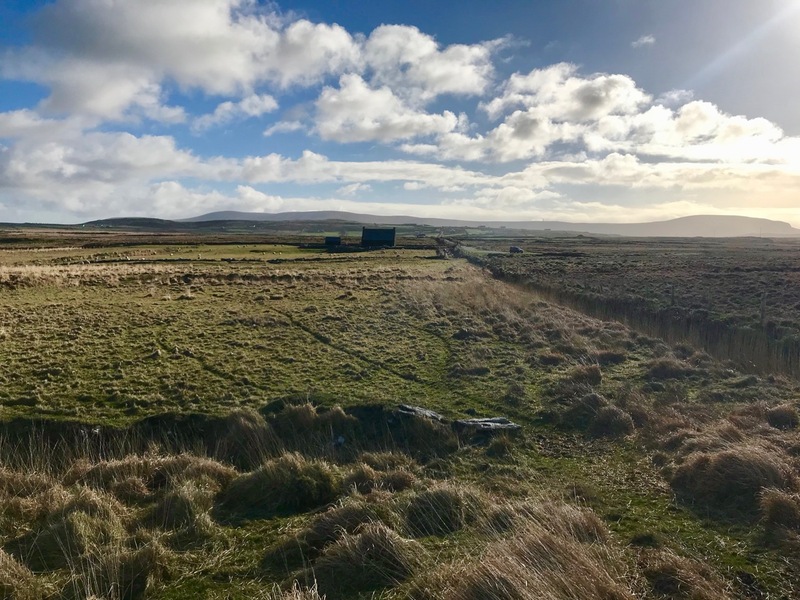 At the very end of January – when we should have been in the dark depths of winter – we headed off to Valentia Island in County Kerry, and enjoyed sublime golden sun. This time of the year often gives us the best light: we experienced this on our expedition through the Yellow Gap in West Cork a fortnight ago, and again during these three days in our neighbouring county last week. It’s to do with the low sun: somehow it enriches the amber hues of the landscapes, which are themselves enhanced by backdrops such as the one above. 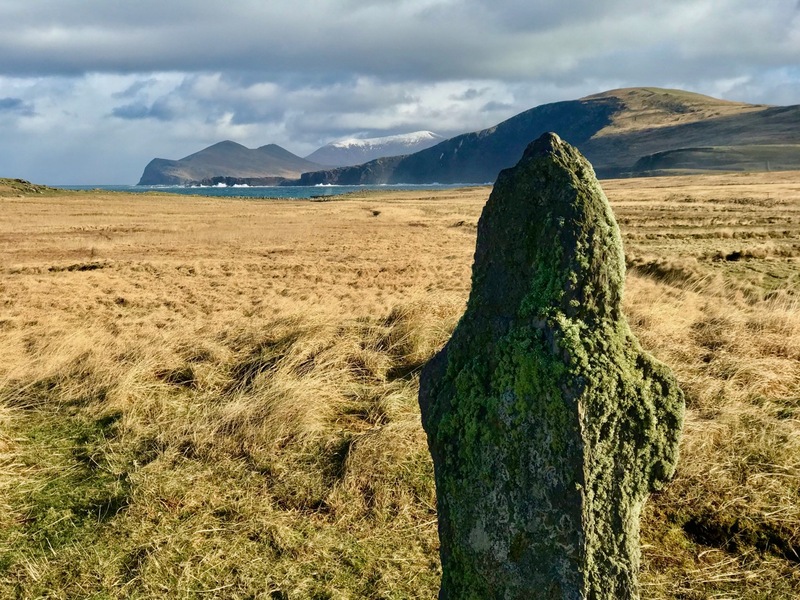 An ancient stone is set against a distant turquoise ocean and dark, snow-capped mountain peaks. Holy wells were on the agenda (see Finola’s post here), as we were joining our friends Amanda and Peter Clarke from the Sheep’s Head. 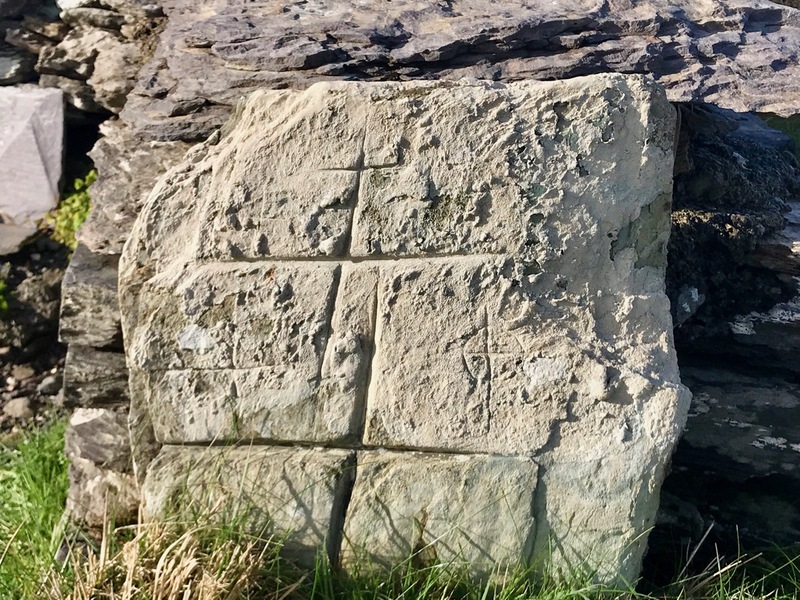 Amanda has nearly come to the end of her chronicle which records all the Holy Wells in County Cork, and she is now starting to explore those in County Kerry. I’m not going to say too much about the wells we saw, as Amanda will cover them in great detail, but the expedition certainly provided great opportunities for observation and photography, and caused us to wonder – again – at this unique aspect of Ireland’s history and traditions. All the photographs above are from a remote and atmospheric site on the north west side of Valentia Island: St Brendan’s Holy Well. 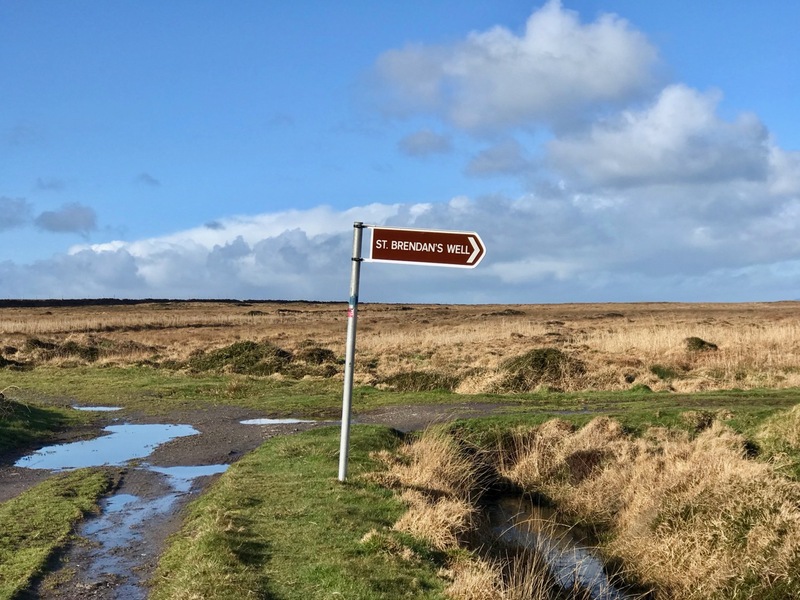 It’s a long way off the beaten track: desolate, bleak and boggy – but justifies making the effort. 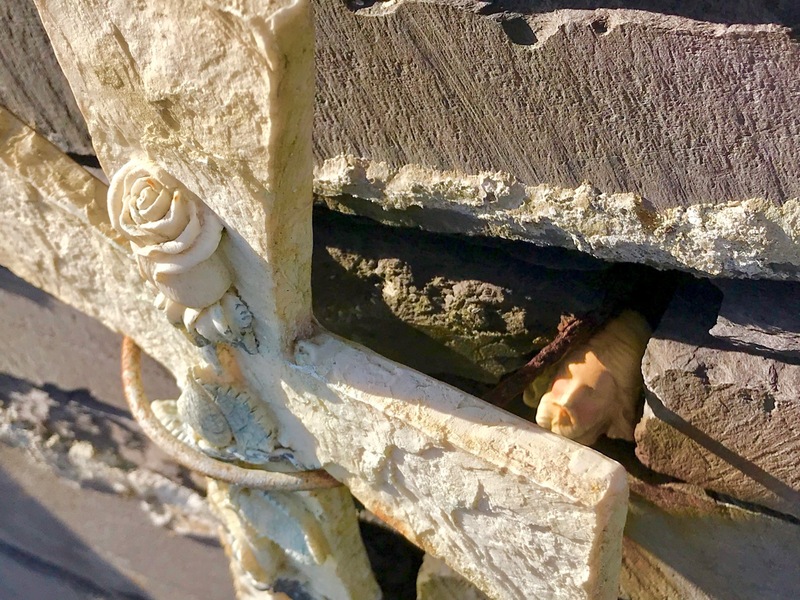 There are ancient stone crosses, carved slabs, cures to be had, and history. St Brendan himself journeyed there from Tralee in the fifth century, climbed the cliffs at Culoo, and found two dying pagans at the site: he anointed them and they became Valentia’s first Christian converts. 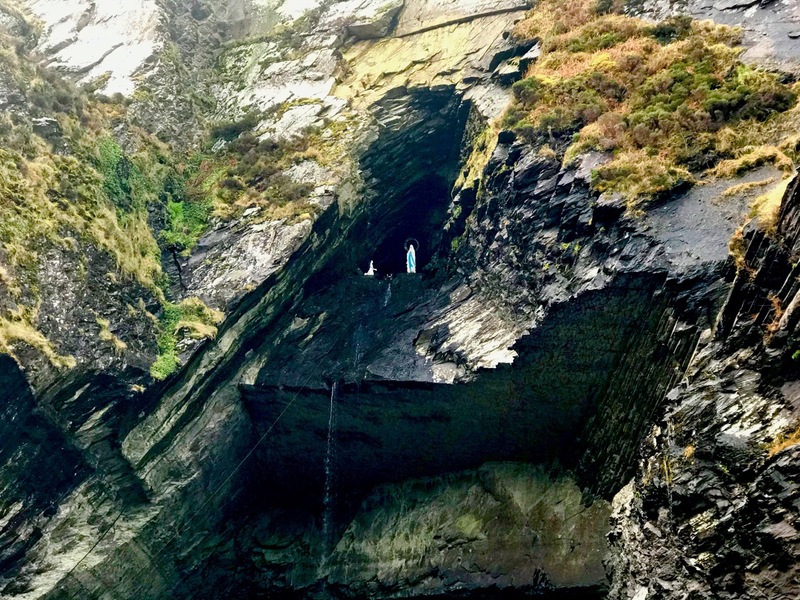 Above – the way to St Brendan’s Well, Valentia Island, passes by O’Shea’s Pub . . . one of the furthest flung bars in the world, that you can’t—and could never—buy a proper pint at . . . The story is here. 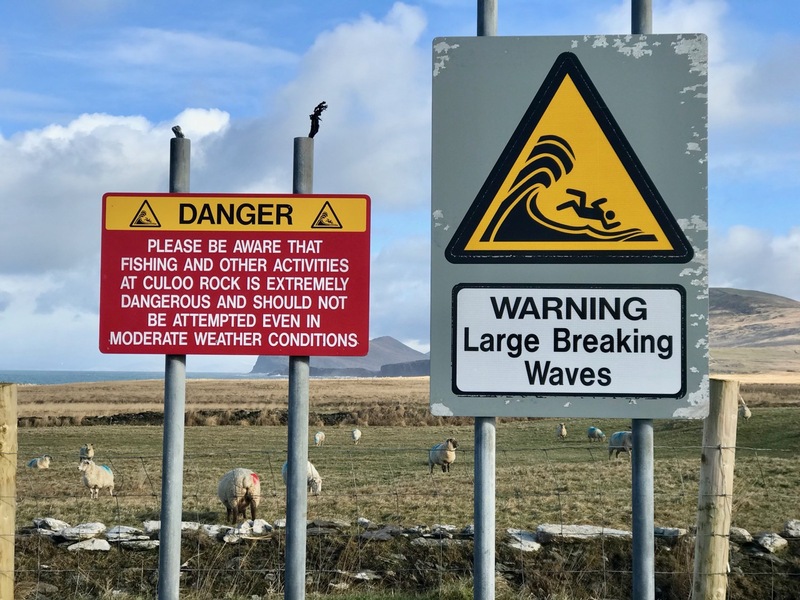 I certainly endorse that sign in the centre, seen on Valentia Island. 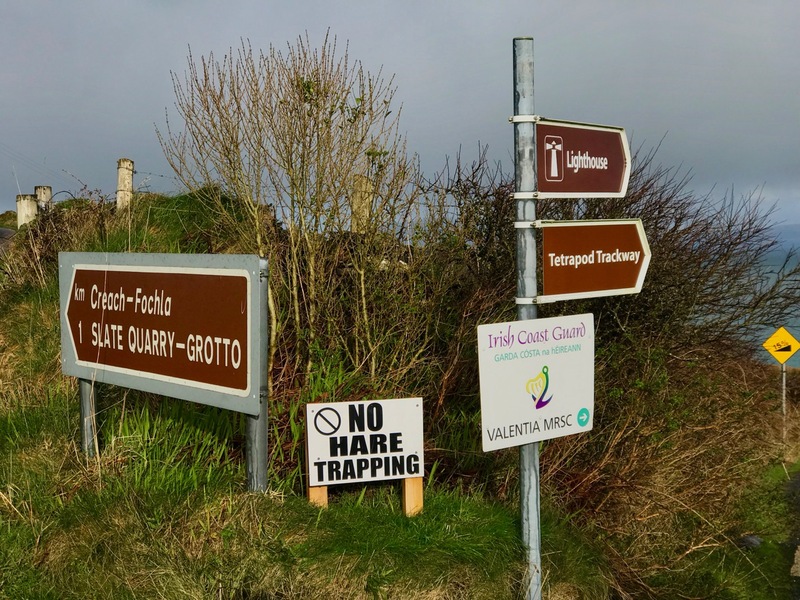 Hare trapping in South Kerry is illegal – and so it should be! But – how could we not follow a sign that says: Slate Quarry – Grotto? 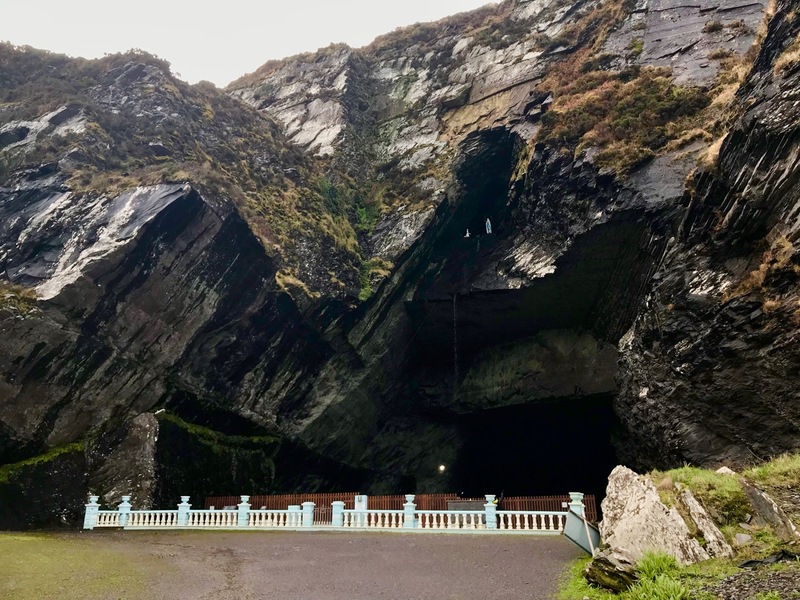 The Grotto – in this case a statue of the BVM together with Saint Marie-Bernadette Soubirous, the girl who witnessed Mary’s apparition in Lourdes – was installed in the Marian Year of 1954 in a cave high above the entrance to the Valentia Slate Quarry on Geokaun Mountain, at the north end of the Island. The Quarry had been opened in 1816 and supplied slate to the Palace of Westminster, Westminster Abbey, St Paul’s Cathedral, London railway stations and many another building project. The quarry excavated a huge cave into the mountainside, and closed after a major rockfall in 1910. Fr James Enright, who was the PP of Valentia in the Marian Year, saw a golden opportunity in such a setting for a commemorative grotto. Fr Enright decided exactly where the statues were to be positioned, but the burning issue was how were these heavy items going to be put in place and worked upon at over 90 feet from ground level? The answer came in the building of a deal timber ladder. Jackie Clifford , who was a blacksmith based in Gortgower, made the iron to bind and reinforce the ladder and was helped in his forge by Denny Lyne and subsequently aided by other islanders. Having been transported to the quarry in sections, it was assembled there and put in place by the volunteering islanders. The ladder was over 100 feet long, being four feet wide at the bottom narrowing to a foot. and a half on top. The sections of ladder were joined at the various points with a four foot lap. Many island volunteers were enlisted with each townland taking their turns to work. The initial work involved levelling a massive mound in order to form a proper base. This was quite labour intensive, being done with pick and shovel. The ladder was hauled into place by means of a block and tackle pulley system with people at the ends of ropes from above and to the sides in order to control it and put it in place. As one islander succinctly put it “The greatest miracle to happen there was the erection of the ladder”. Subsequent to the ladder being put in place, a number of daring and intrepid islanders had to climb it for the purpose of erecting the statues. The statues were hoisted up by rope with other tools and building materials. The concrete for the base was mixed by shovel above. The Quarry has recently reopened, and it’s quite surreal to stand in front of the grotto with the sound of heavy machinery reverberating at the huge cave mouth from deep within the mountain. Have a look again at the signs above: one points to ‘Tetrapod Trackway’. This is surely a must-see for any visitor to Valentia Island as the fossilised Tetropod footprints here, representing the point at which life left the Devonian Seas 370 million years ago to begin to evolve on dry land, are the best examples of only four sites found to date in the world! We hurried to have a look – but the site was closed for repairs. You can see a picture of the tracks here. 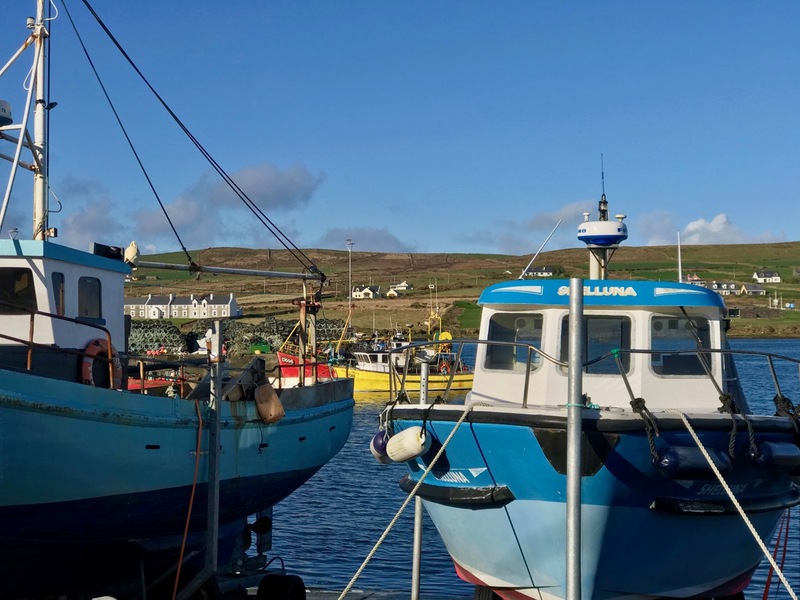 In the winter sunlight, the little village of Portmagee which stands at the threshold of Valentia Island and connects to it by a bridge opened in 1971, looks like a picture postcard. In fact, the bridge was opened twice – once on New Year’s Day, when it was blessed by the Bishop of Kerry – and again at Easter, because there was some debate about whether the first opening had been ‘official’ or not! 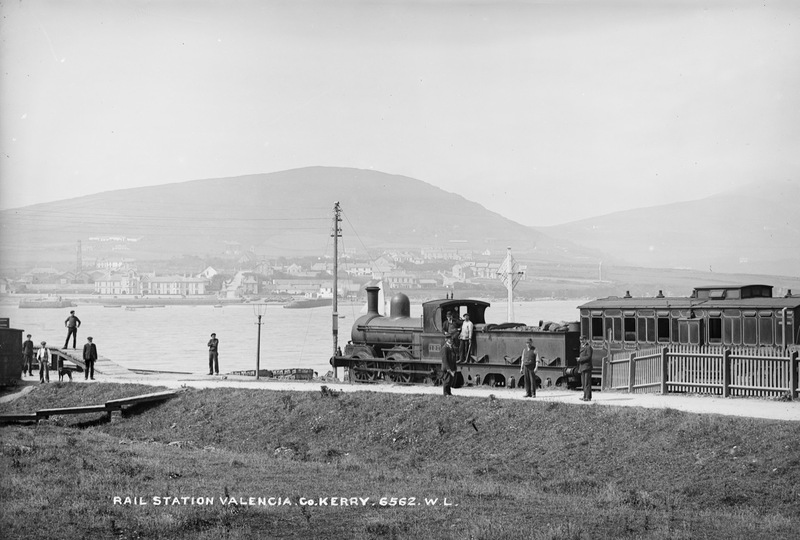 Here’s a railway map and photo dating from around 1901 showing ‘Valentia Harbour Station’. In fact, it’s not on the island at all, although Knightstown – the ‘planned village’ designed by Alexander Nimmo for the Knight of Kerry in the 1830s can be seen across the water. 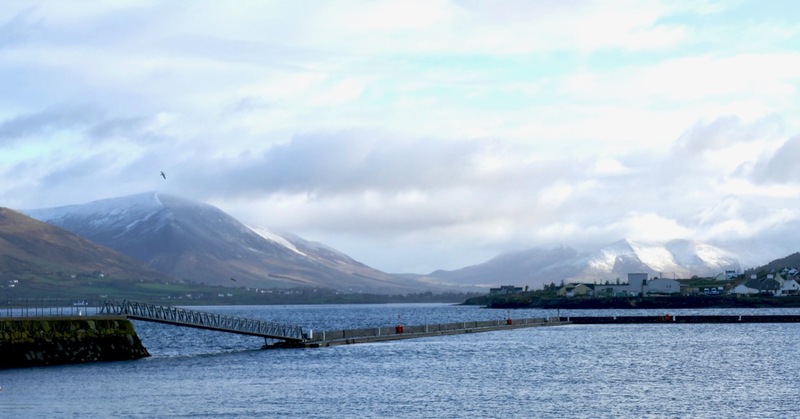 The station – the terminus of the most westerly railway in Europe – is on the mainland, to the east of Valentia Island, which could be reached by a ferry. 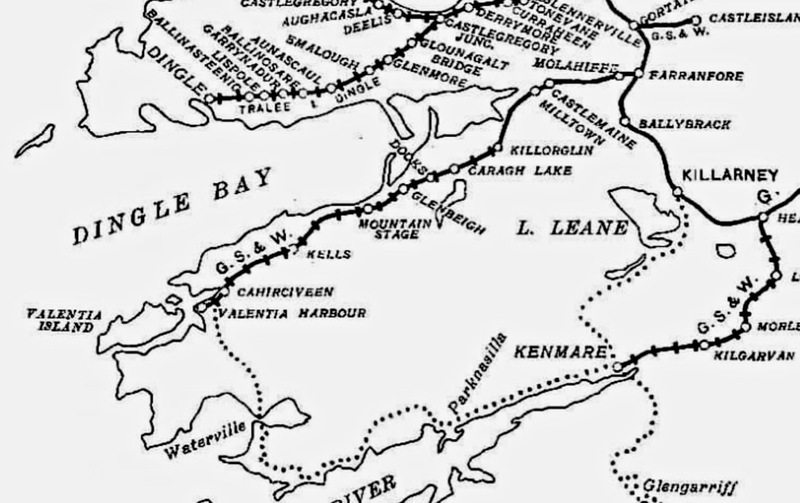 The Farranfore to Valentia Harbour Railway was 39½ miles long and operated from 1892 to 1960. 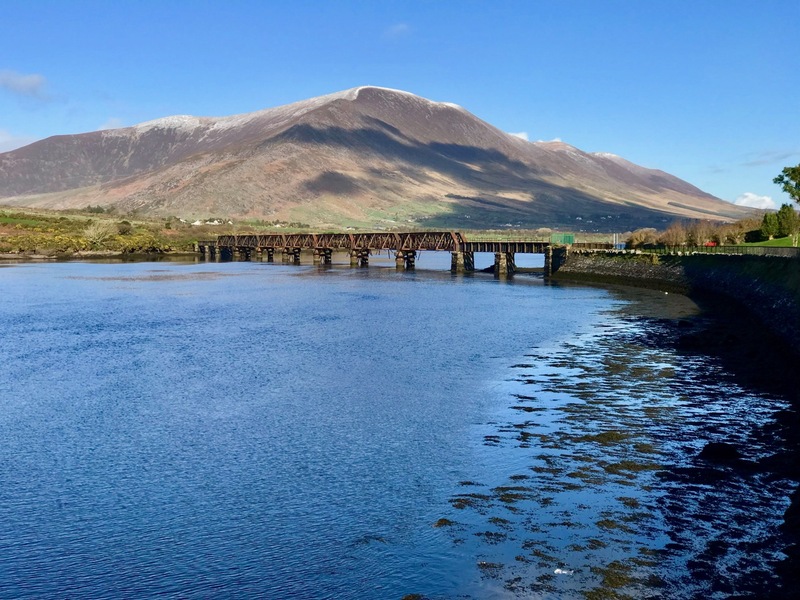 The photo below shows the Valentia River Viaduct just outside Cahersiveen, now derelict but hopefully to have a new lease of life when a planned cycling greenway is developed along the old railway track. 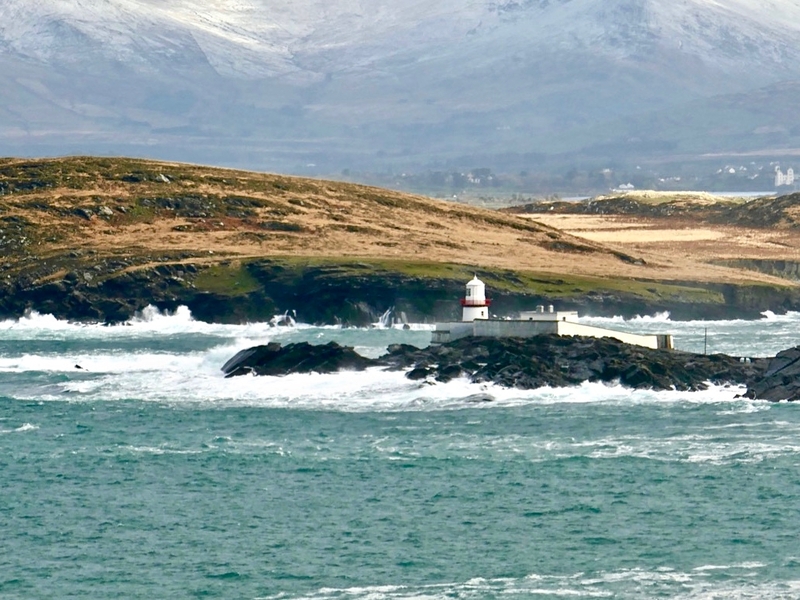 Valentia Island has a great deal more to offer than I can show in a brief post. It’s well worth making the journey and staying for a little while: there is such varied landscape to be experienced – a microcosm of the West of Ireland, in fact – and much history if you want to delve under the surface.